Soldering and De-Soldering the GPU, CPU & the Samsung "Memory Chip". Red rings? Error codes? Ring of Death? 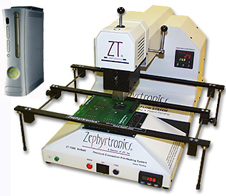 Repairing the Xbox 360 printed circuit board (PCB) is easier than ever with the ZT-7 Hot Air Soldering Benchtop System. Easy for reflowing (re-soldering) chips, or de-soldering and removing a GPU, CPU or Memory Chip, and replacing and re-soldering them back to the PCB. The ZT-7 System is affordable, has 15 years of proven performance, is made in the U.S. with a 2-year limited warranty. Don't be fooled by IR systems that may "repair" a PCB temporarily, but actually harm boards and chips. Complete reflow of the entire solder ball on each connection is required, not only "tangential reflow" that later reopens as the PCB flexes during console play. Video Comparisons & Demonstrations: 4 Methods of Preheating & Solder Reflow illustrates the advantages of forced convection and why it's the global PCB industry standard worldwide. PCB Fixtures Must Be Independent from both the lower pre-heater and from the upper reflow heater. If one is trying to repair or reflow a large quantity of PCB's, then speed is important. So having to wait for a large PCB (like the XBox 360) to first preheat, and then later to cool down for a long time before moving on to the next PCB wastes a lot of time and money and profit. An Independent PCB Holding Fixture is simply essential for reworking PCB. Save time and money. Learn why: Video: The ABC's of PCB Holding Fixtures. And don't overlook the fact that the ZT-7 is equally effective for PlayStation® PCB Repair & Rework Station. Not Just for Game Consoles, your ZT-7 is also a moneymaker if you are repairing smartphones, tablets, laptops and most every type of PCB on earth! Q: What are these chip packages that Microsoft® and Sony® call the GPU, the CPU, and the Memory Chips? And why do they look so different from other components? Above left: Bottom side of a QFP Surface Mount Chip with the leads at the side for soldering to the PCB. Above right: Bottom side of a BGA Chip with solder spheres (balls) at the bottom for soldering to the PCB. 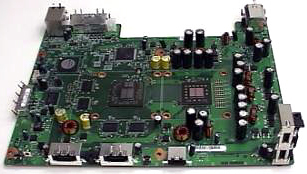 Many chips on the XBOX 360® and PlayStation® PC Boards are packaged in the BGA format including the GPU, CPU and Memory Chips. Indeed, most consumer electronic PCB's today incorporate more and more BGA style chips as they are more robust in construction and have faster gate speed for processing. Once a BGA is placed and soldered to the PCB, you can no longer "see" any connections (balls): they are underneath the chip and not visible to the eye. The XBOX and PlayStation® PCB's chips are all soldered with lead-free solder, not the more traditional solder. Lead-free solder requires higher than traditional temperatures so PCB preheat imperative. At the left, you can see the XBOX 360 printed circuit board populated with its components including the critical GPU, CPU and Memory Chip chips. And shown below is the XBOX CPU component which is Ball Grid Array (BGA) styled package (see the yellow highlighted sidebar for further explanation). Effective PCB pre-heating is critically important for success and quality soldering and rework of XBox 360 chips and boards. And this is where many systems "repair stations" fail miserably because of their ineffective IR preheating under the PCB thus requiring unacceptable higher final soldering temperatures above which permanently damage the chips. And once a chip is damaged, it then has to be completely removed, replaced and re-soldered. Beware! Some "repair stations" have such ineffective upper heaters that they require the entire PCB to be pre-heated underneath to over 200°C for over twenty minutes! Worse, the manufacturers of these "machines" advise users to cover chips with foil during the process. Are they crazy? This nonsense is prohibited by reputable PCB labs and repair companies. BGA's have less metal content than old traditional chips and components with leads. These chips are far more sensitive to high temperatures. A low temperature (150°C) preheat around 3 minutes is required before any rework, soldering or desoldering is to be made. BGA's have technical data sheets with strict temperature limitations to prevent damaging them while soldering. The ZT-7 is the very same soldering system that was used by NASA to place and solder the critical, high-reliability I.C. 's on the two Mars Rovers whose mission was so successful in 2003 and 2004. Good enough for NASA and easy enough to repair an XBox 360 PCB! And at a great price! Click here to learn more detail about the ZT-7 Hot Air Station. Helpful Rework Guide: Zephyrtronics ships each ZT-7 with a detailed and helpful owners manual along with the 39-page report by NASA for its employees which features approximately 300 photographs filled with technical tips and techniques. In addition, for those reworking and repairing XBox360® modules, we also include a step-by-step illustrated guide for removing and replacing the components and even practice PC Boards and chips! A Warning from NASA About IR Rework Systems: "Hot plates and infrared pre-heaters are not recommended...The reason that they should not be used is that the thermal reaction times, energy transfer rates and efficiency are never consistent." The ZT-7 Has No IR whatsoever, only the decades proven "industry standard" of forced convection hot air. The ZT-7 is easy to operate with digital, closed-loop, programmable temp control, digital countdown timing, bottom-side preheat and thermal profiling for quality work. The ZT-7 is not limited to just the XBox PCB's, but is ideal for reworking smart-phones, laptops, plasma television PCB's, prototype and small production runs. For more specs, technical info and product details about our popular XBox® or PlayStation® repair stations, click for the full webpage for the ZT-7 Hot Air BGA & SMT PCB Center. Or call us at our Los Angeles factory Mon-Fri 8-6PM (Pacific) at (909) 865-2595 or e-mail david@zeph.com. We're happy to help. ©1996 - 2011, 2012, 2013, 2014-2016, 2017 by Zephyrtronics®. All rights reserved. The information, text, images, photographs, charts, graphs you receive online from Zephyrtronics® are protected by the copyright laws of the United States. The copyright laws prohibit any copying, redistributing, retransmitting, or repurposing of any copyright-protected material. Zephyrtronics is the registered trademark property of JTI, Inc. "The Science of Zephyrtronics" and "Simplicity Through Innovation" and "Zephlux" and "ZeroLead" and "Zero Balling" and "Zero Residue" and "Post Cooling" and "Post Cooler" and "AirBath" and "SolderGlide" and "SolderMill" and "Just So Superior" are the protected trademark property of JTI, Inc. "Zephyrtronics" and "Low Melt" and "Air Fountain" and "Fountainhead" are the registered trademark properties of JTI Inc. *The above names are the registered property of their respective owners. CLICK HERE to Go Directly to Our Easy-to-Navigate and Illustrated Product Directory.